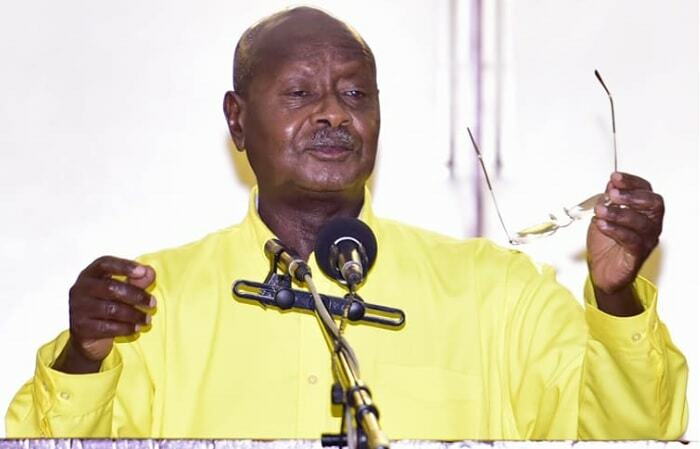 President Museveni in a special sitting of Parliament, yesterday, announced ten measures that government was to put in place to curb the insecurity in the coutry that include among others police using drones, all car owners having electronic number plates and of course the misuse of social media among others. The President was yesterday addressing a special sitting of parliament and top on the agenda was the insecurity in the country, 10 measures that the government will undertake were announced. 2. Electronic number plates with electronic signals installed at the cost of the owner. He added that people's privacy will be protected. 4. Installation of cameras on town roads and streets and along highways. 5. Modern forensic laboratory to be put in place to capture thumb prints and DNA that will be helpful in investigations once blood is left at the crime scene. 6. UAVs (Unmanned Aerial Vehicles or drones) and light helicopters will be used as a way of getting to the scene quickly, 999 and the flying squad have been revived. 7. A law in the use of drones is in the offing, only 30 UAV's have been authorized by the defense committee. 500 drones were impounded. 8. Misuse of Social Media - Criminals use social media to threaten and create panic, criminals abusing its use will be located, we won't block the sites, but we will be able to get the jiggers than cutting off the entire foot. 9. More scanners under the Uganda Revenue Authority (URA) will be acquired to check all containers coming into and exiting the country. 10. Back to the army. Our strategy is a small, professional, well-equipped army, backed with a large reserve force. Our military capacity is robust created over last 50 years. We have the capacity to defend Uganda.